One of the reasons I love shooting destination wedding is because you never know what sort of magical location you might encounter. 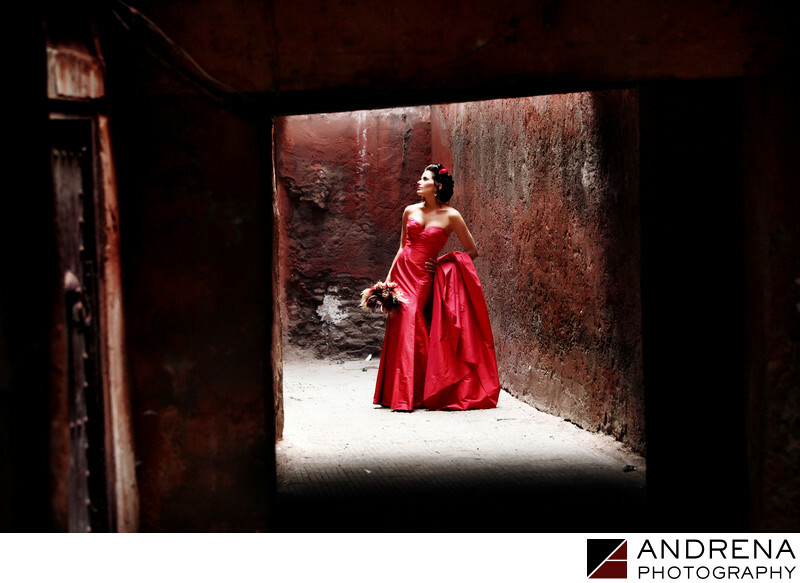 This beautiful location was in a tunnel near the souks in Marrakech, Morocco. The bride wore a red wedding dress, so I loved positioning her against all the dark colors and textures that were available throughout Marrakech. This wonderful location was at the end of a tunnel near the Riad that we were staying in, and since it was open at the top, daylight was streaming down from overhead (a photographer's dream). The end result was just stunning. The bride's bouquet was actually made of feathers, which perfectly complemented her stunning red wedding dress. Destination wedding photographed in Marrakech, Morocco.